I’ve a new found love for gowns, and PurpleMoon is on the top of my list of favorite places to find them. Recently however, PurpleMoon has put out some mesh dresses that I have not been able to resist, so now we can wear PurpleMoon not only on the special Saturday nights out, but on any day of the week! First up, the new Trinity Dress, available in a variety of colors, and very fun to wear with my fave Bax boots. At the writing of this, the dress is available for a special price of 55L so hurry on over and grab them all. Mesh has taken some time for me to adjust to. I’ve found, for me, what works best is to alter my basic shape to fit standard mesh that works for my shape best, then be sure to wear the alpha layer included so bits dont show where they shouldn’t. I often have to drop things here or there, I just make sure to label each shape so I can remember what it is. It’s so fun, once you find a mesh that works and get your shape set, it opens a whole closet of possibilites. Glitter and glamour. Sparkle and shine. Enchantment and elegance. 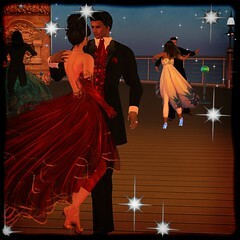 What more could a girl want for her perfect evening of dance and romance. If you’ve a special evening coming up, and you’ll certainly have several with the holidays fast approaching, you just may want to visit Enter Mares for a bit of magic to add to your night under the stars. The Clair gown is a recent release and is perfect for a night out in glamour, wearing it, you’ll make a lovely addition to any gentleman’s arm. I love how the gold is so well done, it shines and adds just the right touch of sparkle to catch the starlight. Flounces and floof are still new to me but I’m learning to love it all, and this gown offers a nice balance for swirl on the dance floor. Your dance card will be sure to be full all night long, so what are you waiting for? Get on over and get your new gown now! Summer is over, tho it really doesn’t feel like that is possible. My MiniMe has gone back to school, and it’s time to start trying to get things done again at home, and in SL. The summers brought a lot of surprises, from almost losing my only brother, to a week spent at Sturgis during Rally (and another at Lake Superior) and even some new family horses, all of which reminded me just how important it is we make the best of each day we have, and to reach out for that which we love, and to not be so afraid to speak our feelings. Vintage Fair has begun while I wasn’t looking, and Reghan of Hatpins has created a pair of earrings I’ve not wanted to take off since she sent them to me. They are so well constructed, perfectly detailed and oh-so-touchable, as always with Hatpins, and go with a multitude of different looks and era styles. Vintage Fair ends soon so if you haven’t been over there, it is a must see, many things there a girl, or guy, with a fashion interest, must have. Everyone knows Zaara, LAP and Belleza, no need to explain who they are, tho it never hurts to say it again when it comes to designers of their caliber, each of these are exceptional designers that excel in what they do. SLDD, short for SL Daily Deals, is a fairly new club on the grid, that will be bringing us some great deals, and sometimes exclusive items, from these (Belleza not included but I just love this skin!) as well as other designers. SL Daily Deals features select designers which will be offering sale items throughout the month at 10% , 20% and 25% off in their stores. You’ll be able to find them easily, just look for the SLDD signs. Each day, one store from the group will have one item marked down to 50% off just for that day, and it may be an exclusive item, not to be sold again. SLDD is a Shopping Club, and works a bit differently then what we’ve been seeing in the past. To join the club purchase a Club Membership Card available at any participating vendors store and then using this much like you would a gift certificate to purchase the sale items. Simply wear the card, click the sale sign for the item you wish to purchase, give it a moment to sync and then purchase your item. Take care to make sure you are purchasing it for the discounted price and not the regular price, and also make sure your card has sync’d or you may be spending more then planned. It really is much simpler then it sounds. I love Zaara, and could not pass up the opportunity to get an exclusive color, which was one of last weeks SLDD 50% off items, and as I expected, I am loving this tunic. It is available still in various other colors, I know I’ll be getting another or two. I paired it with her newest pant release, and love them too and have been wearing them with various other tops, definitely this will be a regular in my wardrobe, and I will be going back for more colors. I have hundreds of poses in my fave Tillie’s (newly updated 3.1 version) pose stand and a good chunk of them are from LAP, so when I saw she was participating in SLDD’s last week, I hurried over and purchased a great set at half price, and some more discounted ones too. While some of these items (only the purple Zaara) may no longer be available, I thought it was a good chance to not only show off good releases but to point out the fact that ..you simply must follow SLDD daily so you do not miss anything good! Also, I am wearing a new love, the newest Belleza skin, Elle. This particular make-up is part of the group gift, which as of a couple days ago, was still available in the store if you are a member of the group (250L to join and oh so worth it). I am still debating which skin tones/make-up packs to purchase at this time. (Credits – (links to all stores in sidebar):Skin – Belleza – Elle – BR SK – Group Gift. Pants – Zaara – Churidar Slacks – White. Tunic – Zaara – Syona Kurta – Purple (SLDD Exclusive, 50% Off, no longer available). 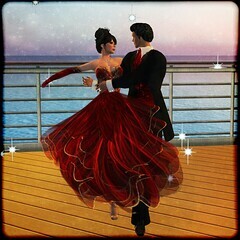 Poses – LAP – Bolly Set (purchased at 50% off SLDD, no longer available at this price). Shoes – Tesla – Vixen. Lashes – Celestial Studios. Eyes – Poetic Colors – Dark Wood. Hair – Audacity – April – Onyx. Pose Stand – Tillie’s 3.1. Location – Personal Home. All items purchased or obtained by my own means unless otherwise noted.